Gullfoss blanket is a baby or stroller blanket with a simple and easy cable pattern. I named it Gullfoss after the great Icelandic waterfall, because the stitch pattern reminds me of the falling and churning waters, which I saw when I was a small girl. 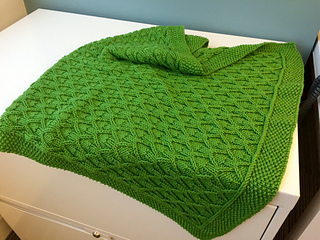 The cable pattern in blanket is framed twice, first by an inner frame of horizontal stitches and a knit column in either side, and secondly by a wider seed stitch border. The blanket’s strong lines on both front and back makes it equally suited for boys and girls. The cable pattern is easy and thus well suited for beginners as well as experienced cable knitters. The pattern is both charted and written out in the directions below.